Every single item in this apartment is brand new. How do you design a home for a family that doesn’t actually live there? This was the challenge designer Megan Hopp faced with this three bedroom apartment in Manhattan’s Upper West Side. 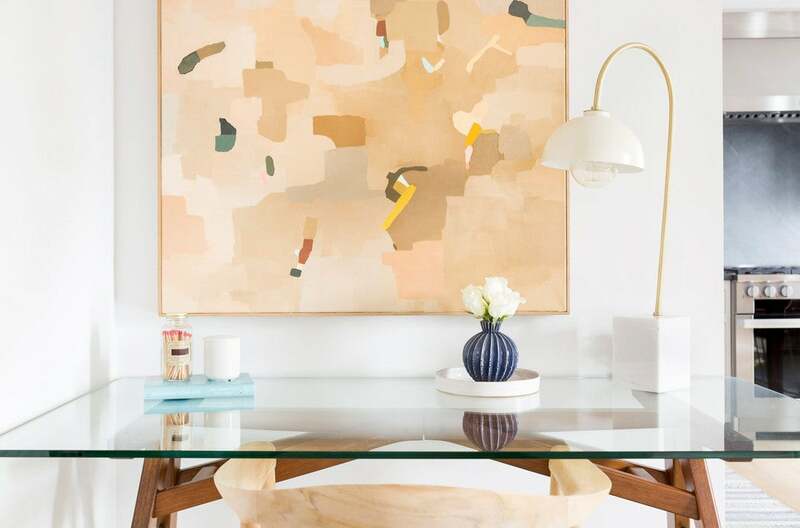 The 2,067-square-foot home is spacious—especially by New York City standards—and when it came time to fill it, Hopp found herself in the slightly unusual position of not having any personal mementos or pre-existing furniture that needed to go in. Turns out, the lack of a specific wishlist was something of a blessing. Hopp worked with her clients to pick out every single piece in the apartment, curating a space where literally every object was chosen because it suited a particular aesthetic. No mismatched chairs no cheap furniture kept around from necessity, no tacky ceramic collection bequeathed by some great-aunt that you hate but feel guilty tossing. Instead, the modern neutral color palette lends itself to a bright-filled space, vaguely inspired by the family’s globetrotting nature. Read on to see how Hopp created this calming oasis in about a year. There’s a ton of natural light in the space due to the massive windows—was that something you wanted to play up? Yes, definitely. The [clients’] initial request was, we want to keep this space as white, bright, and light as possible. They wanted it to feel like a relaxation spot; like a vacation home they could look forward to coming into and decompressing from real life. What did you prioritize to make that happen? Texture and material were really important. In order to avoid that matchy-matchy feel, it was a puzzle game of mixing various kinds and shades of wood, keeping it cohesive but also letting each room have its own look. I’d definitely say the attention to wood was top priority in the project. Can you tell us about how you settled on the color palette? That did shift a bit in the project. In the beginning, the request was for everything to be natural, neutral colors along the beige scale. As we were about 50 percent through the project and moving more towards textiles and accents, there was a feeling that maybe it would be nice to bring in some color here and there. We began with blue in most of the accent rugs. From there we made our way into very slight hints of green. It felt very clear once we played around with it that keeping all warm tones out of the space was the way to go. Did you find sticking to that neutral palette restrictive at all? Not really—I didn’t have to accomodate a vast amount of real life stuff, which inherently brings in a lot of color. There wasn’t pre-existing art or a ton of photos or books. I was able to really pare [everything] down and only use what we really needed to use to set up the space so that we only had the desired elements. What are your tips for making neutrals feel fresh? Mixing beige or tan colors with metallics and grays; I feel like people either go in one direction or the other, and it becomes too conservative, too cold, or too sterile. I would suggest not getting too thematic in your neutrals. In the bedroom that has the light fixture with the tassel, for instance, one of my favorite things about that room are the really raw metal nightstands that feel very industrial next to this soft and comfy beige linen comforter. It’s such a beautiful combination. You mentioned wanting to keep it relaxing; how did you set about accomplishing this? Major key factors were the really light and transparent window treatments. We didn’t do anything heavy or abrasive. That was a big deal, to honor the windows and the light in that way. As this isn’t the family’s full-time home, how did you incorporate elements of their personality? It’s not a home of collections by any means. The focus was on selecting furnishings and decor that had a nod to something old, even though they were new. For example, the bone inlay dresser: Although that was a new piece, it felt reminiscent of travel and things you would see elsewhere in the world, because that’s the history of where that type of craftsmanship comes from. Are there any design differences you as a designer consider when you’re creating a temporary home? The curse and the gift is that you’re not really given anything to give you direction. But the gift in that is that there are so many functional things you have to think about with a full-time home; in New York City, mostly having to do with storage. That wasn’t the case here. That was such a weight off my shoulders. There aren’t these everyday requirements you need to think about and you can focus your efforts on creating experience as opposed to function. The biggest challenge was that my clients were always asleep when I was awake! They were really easy people to work with, but it was an interesting experience. I did a significant chunk of work on the project before I had ever met them in person, and we’d only had one phone call. I really love what I call “bedroom number two”—the one with the light fixture with the tassel. That room is, in a way, the simplest in terms of composition and I wasn’t expecting to like [it] the most. But when the pieces went in, there was just this magic chemistry that happened. Photography by Kelsey Ann Rose.